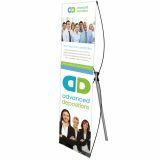 Custom retractable banner stands allow marketers to exhibit their business information with a difference at the tradeshow venue. 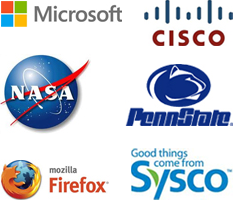 The large canvas area adds to the credibility and visibility of the brand information. 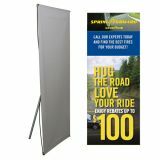 Banner stands are easy to transport and perfect to build visual interest at your tradeshow booth. 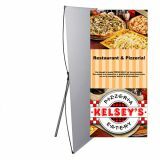 ProImprint offer one of the most reliable and high quality selections of affordable retractable banner stands in the industry. From indoor retractable banners to outdoor friendly banners, our selection will help you to make theright impressions at the right place! Price includes anti-curl printed graphics, padded carry bag, necessary hardware, online design proof and artwork assistance. Lowest price match guaranteed. Are you looking for a signage that is affordable, portable and adorable enough to set up during the next tradeshow? You can easily have it from personalized retractable banners sold at ProImprint. All our retractable banners are qualified to meet tradeshow or any outdoor advertising needs. Roll up banners are usually used in tradeshow venues, exhibition areas or office premises and they help to raise brand awareness. 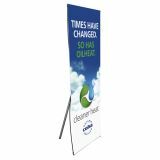 Roll up banners are important promotional tools for retailers and tradeshow booths because they are easy to set up and transport. The printed artwork is usually rolled to the base during the transportation. Many roller stands are offered with portable carrying bags. A marketer can easily transport them to tradeshow venues and set them without additional assistance. Most tradeshow stands are offered with black and silver base colors because they remain neutral and won’t distract attention from the main color theme. 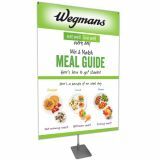 Retractable banners are ideal choice for big departmental stores, restaurants, expositions, lobbies, malls and retail stores, trying to attract quality visitors to their store. These pull up fixtures can be used at all those places where marketing through eye-catching artwork becomes a necessity. Wipe out retractable banners with wet or dry cloth after the event. You can use mild detergent such as hand soap to wipe away the dust accumulated on the banner. Full color printed roll up banners should be stored in cool and dry place when not in use. 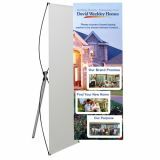 Avoid positioning these customized roll up banners under the sunlight or areas of extreme heat such as storage facility or car trunk. 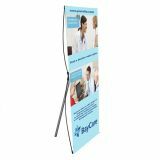 At ProImprint, we offer a vast selection of retractable banner stands that meet promotional needs of every company. Our clients range from local family businesses to large business corporations who have purchased these roll up banners for various exhibitions. Best of all, our prices include all necessary accessories required to transport retractable banner such as a padded carry bag, necessary hardware and anti-curl graphics. If you are puzzled about selecting the ideal customized retractor banner stand for your promotions, feel free to get in touch with our tradeshow branding experts at 844-776-4677 or write to us at info@proimprint.com.